GASMAX® anaerobic digester is a high mixing efficiency and low energy demand product with central/top-hanging mixing system. Its design ensures a stable process for high-gas production. 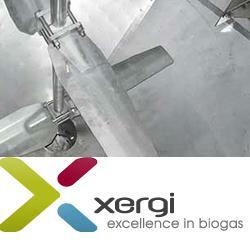 Xergi anaerobic digester are designed based on our own unique design – the GASMAX® anaerobic digester is a high mixing efficiency product. This is a continuous flow biogas digester, where the biomasses are continuously fed into the system. The flora inside the bacterial digester will break down the biomasses and produce methane as a result. GASMAX® Xergi’s anaerobic digester is designed with a 1:1 height/width ration and with a central, top-hanging mixing system.